What is it with weather forecasting in this country? Is it that difficult? Clearly it must be because the standard down here in The New Forest has been relatively poor. The inaccuracy, it must be said, has sometimes been to the betterment of what was expected to happen. Not so today, which was supposed to remain dry until a weather front to the north drifted down here. We set off on another combination cycle ride/walk to seek out a few more ponds supposedly frequented by Odonata. Yes, I know this is beginning to seem like an obsession, and it may well be, but September is pretty much the last chance for dragonfly watching so I’m trying to cram in as much as possible before the onset of winter. Besides, it gives us a handy purpose for cycle rides and walks. 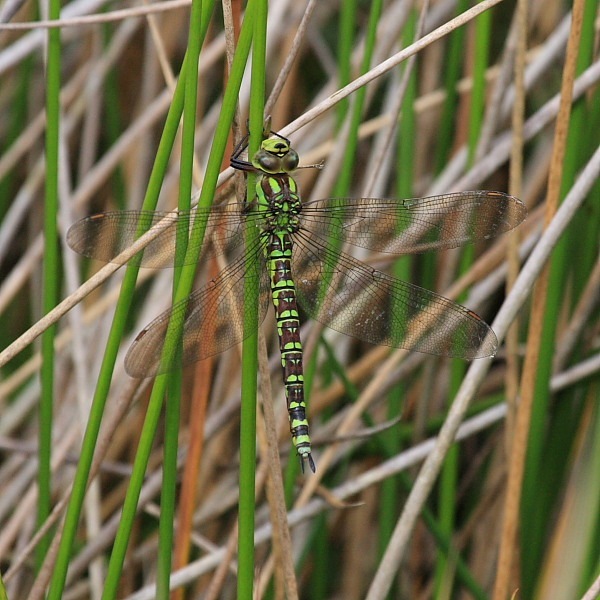 The star performance today came once again from a female Southern Hawker (Aeshna cyanea) not, this time, ovipositing but hanging perfectly still in some long grass beside one of the ponds. The wind was fairly brisk, not a great day for flying insects, and just as I was thinking that not a lot was happening, I initially saw her fly into a clump of grass stems and come to rest. In the same way that two hands are never enough, neither are two eyes, especially as most peoples’ eyes follow each other and act as one rather than operating independently like those of a chameleon. I realize that our binocular vision comes in very handy for judging distance but there are times when we need to look at two things at once. What we humans really need is another pair of eyes. Only then will we be able to keep tracking our photographic target whilst also preparing the appropriate settings on our camera. For the briefest moment, I used my inadequate single, interlocked pair of eyes to set my camera and, in doing so, naturally lost sight of my quarry. I didn’t think my target had had time to flee the scene but I’d lost her completely. Helpfully, Francine, after tossing a couple of stones at inappropriate clumps of tall grass, tossed a stone at the relevant clump of tall grass in an attempt to prove whether or not our lady of the lake was still there. Nothing stirred. “I think she must have gone while I was adjusting the camera”, I said, just before my single pair of eyes once again located her, still clinging doggedly to a grass stem. What little morning sun we had seen had disappeared behind ten tenths cloud cover and temperatures were dropping in the wind so, I suspect, the dragonflies were becoming reluctant to fly. Having set my camera as desired, I could now fix my single pair of interlocked eyes on my re-acquired target and approach to a distance more suitable for a decent close-up shot. Once again a second pair of eyes would have come in handy. Had I had said extra pair of eyes, I could have kept watching my target with pair A whilst also watching my footing with pair B and, perhaps, not have sunk up to the top of my walking shoes in the water-sodden, spongy grass that surrounded my lady of the lake’s lakeside perch. The things we’ll do for a hobby! Once having wet feet, I was free to position myself to get what turned out to be a decent picture. The only additional danger to be avoided was falling headlong into the water. No, I didn’t – almost but I didn’t. If you look at the colour of this particular dragonfly and the colour of the grass she was hanging in, you’ll see how easy it might be to lose sight of her. Without seeing them land, you’d have very little chance of spotting them. Complete with wet feet, we repaired to Burley for a late lunchtime beer. The rain that we weren’t supposed to have yet started, slowly at first but then slightly more persistently. We returned to Guillaume dampened physically but not spiritually, pleased with our morning’s excursion.